Hotel Donyi Polo Ashok was established in the Arunachal Pradesh capital Itanagar sometime in the 80s. Spread across a large plush area with green lawns, the hotel’s architectural design harks back to the bungalows reminiscent of the days of the Raj. Located on a hill and away from busy streets of the city, the hotel has an easy feel to it. A few kilometres away, smack in the middle of the city and adjacent to the highway is Hotel Pybss. Built fairly recently, the hotel is a nod to modern architecture, reflected in its blue-tinted windows, discotheque and dim-lit bar. What, pray tell, do these hotels have anything to do with the current political scenario being played out here? A lot. Hotel Donyi Polo Ashok: A hotbed of political brainstorming. Late Thursday night, media houses in the state received a shocking email from the general secretary of the ruling People’s Party of Arunachal (PPA), Kaling Jerang. Attached to the mail were documents ordering the suspension of seven MLAs from the party, including chief minister Pema Khandu! Although rumours were abound that some MLAs were seeking a change of leadership, until last night it looked as though the state would go relatively quietly into the new year. That was not to be. 2016 saw three chief ministers in the state after a year of political instability. In July, Pema Khandu became chief minister, replacing Nabam Tuki who had himself replaced late Kalikho Pul after a Supreme Court verdict reinstated the Congress government in the state. Pul and his 29 MLAs had earlier left the Congress and joined the PPA during his four-and-half month tenure. Then in September, Khandu took 43 of the 44 Congress MLAs (all except Congress loyalist Tuki) back to the PPA, which is party to the BJP-led North East Democratic Alliance (NEDA). Just when Khandu was getting into the groove of things- meeting union ministers, making key decisions- PPA president Kahfa Bengia decided to issue an order suspending Khandu, Jambey Tashi, Pasang D Sona, deputy chief minister Chowna Mein, Chow Tewa Mein, Zingnu Namchoom and mines and minerals minister Kamlung Mossang. The reason for their expulsion, Bengia said, was indulging in ‘anti-party activities’, although it was not specified what those activities were. The suspension order said that the seven MLAs were being “placed under suspension temporarily from the primary membership of the PPA with immediate effects pending drawl of disciplinary proceeding”. On Friday morning, citizens woke up to another political drama waiting to be unfolded. And as expected the centre of action were the two hotels mentioned earlier. Arunachal Pradesh is home to many things. From lush green hills to wild and untamed rivers, there is much that the state has to offer to both visitors and residents. But what always draws the mainstream media’s attention is the constant power tussle that has become a hallmark of the political landscape here. 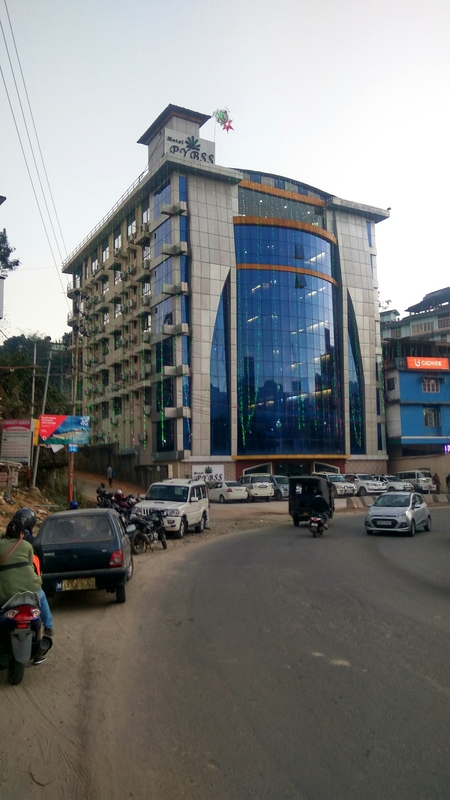 However, because the power play almost always involves MLAs switching loyalties, strategies and decisions are taken not in war rooms of any political party’s offices but in the conference rooms of big hotels in Itanagar. 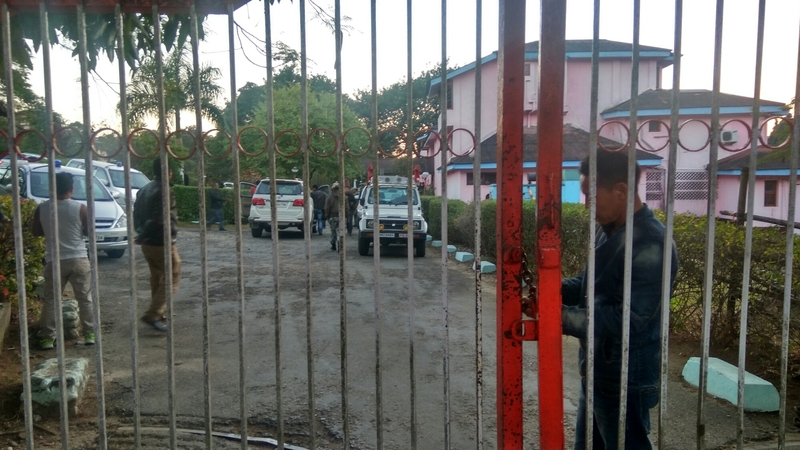 Parked outside and inside the premises of Hotel Donyi Polo Ashok were government vehicles as gun-toting uniformed security personnel stood guard at the gates, ensuring that only ‘supporters’ of Khandu’s camp were allowed to enter. Across town, a similar scene was seen at the parking lot of Hotel Pybss, albeit at a slightly smaller scale where the ‘other PPA MLAs’ were camping. Hotel Pybss: No one is quite sure how to pronounce its name. Backed by the PPA president, those camped in Hotel Pybss are projecting Takam Pario as their chief ministerial candidate. Here too, the gates of the hotel were locked and entry was strictly monitored by guards. While sources from both camps claim to have the numbers, it was only Khandu’s camp that officially came out and boasted of having the requisite numbers required to run the government. Government spokesperson Bamang Felix told reporters that Khandu has the support of 49 MLAs that include 12 from the BJP and two Independents. Senior BJP MLA Tamiyo Taga also said that the BJP will only back Khandu as the chief minister and that no other candidate is acceptable. Taga, who is also a minister in the cabinet, said that the BJP state unit will recommend a merger of Khandu and his supporters to the saffron party and that it is already “under process”. Felix, however, said that no such move is in the offing. As of this evening, both camps were still holed up in their respective hotels. Incidentally, Hotel Pybss is run by Pario’s family while Hotel Donyi Polo Ashok is jointly operated by the state government and India Tourism Development Corporation. If Khandu really does have the numbers to continue as chief minister, he might as well get used to the ambience at the hotel which may soon be turned into the official residence of the chief minister. ​It’s 4.30 PM. The sun is still lingering over the horizon. It’s not quite warm and the sky is overcast causing a certain moistness in the air. At the gates of the Hanuman temple at Ganga Market in Arunachal Pradesh’s capital are scattered shoes, sandals and slippers as devotees and the not-so-devoted make their way inside to get a glimpse of the statues of Durga killing Mahishasura and other deities aside from paying obeisance. 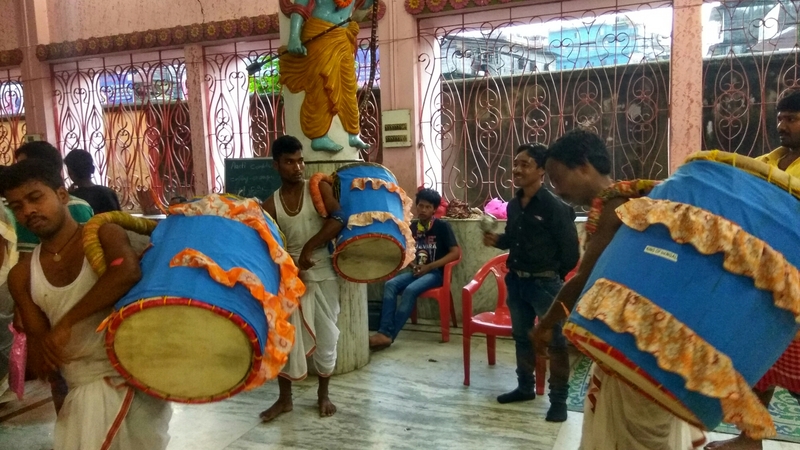 Popular discourse on Durga Puja and its associated celebrations are usually centred around Kolkata and Bengali-populated areas such as Delhi’s CR Park. However, unbeknownst to many people in the rest of the country, Durga Puja celebrations are quite the thing in much of Arunachal Pradesh, especially in the state capital which is home to a large Bengali population. Little wonder then that bright-lit pandals are ubiquitous here. Inside the Hanuman temple, built in 2001, a temporary altar houses the statue of Durga killing Mahishasura. Three men in white dhotis and vests begin to play a familiar tune on their heavy drums while a fourth man keeps the beat with a handheld percussion instrument. The hall almost vibrates with the collective sounds of the instruments and the occasional ting of the bell. Three men and their drums. 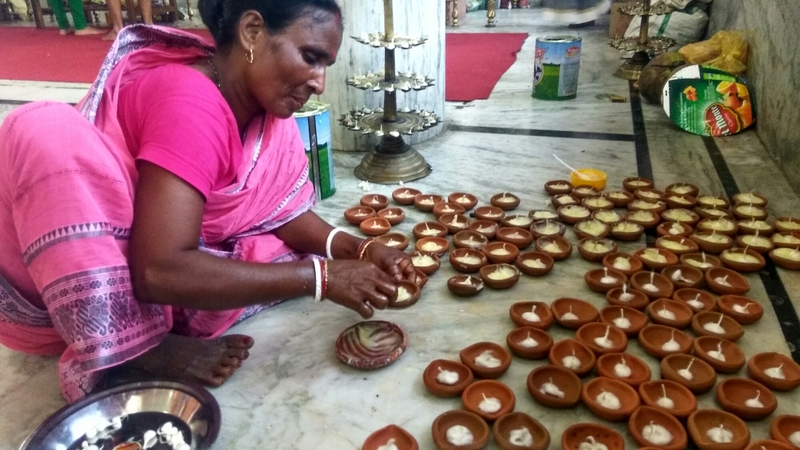 In one corner, Nirmala Roy from Cooch Behar, West Bengal uses her fingers to pour ghee into diyas to be lit and placed in and around the temple. She says that the temple requires 108 of them. Most devotees come and go, offering nominal sums of money as donations while many others offer their prayers from a distance. 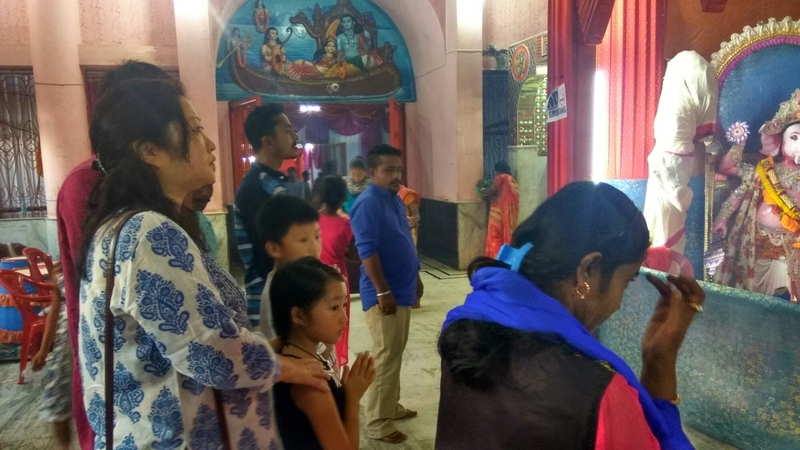 Looking around the temple (and outside it), it becomes evident that Durga Puja is not just a festival for people of a certain ethnicity or religion as the number of indigenous tribal families appear to number equally to that of the Hindu Bengalis. And regardless of their faith, no one forgets to grab a bowl of the free khichdi on the way out. Outside the temple, there appears to be another festival in play. Or rather a mela of sorts. Stalls selling sweets and snacks ranging from laddoos and pakoras to heartier dishes like chicken rolls and chicken biryani, everything is fair game. There is even a stall by a popular pizza chain! “Aayiye, aayiye (come, come),” shout men and women manning the many stalls encouraging people to try their wares. 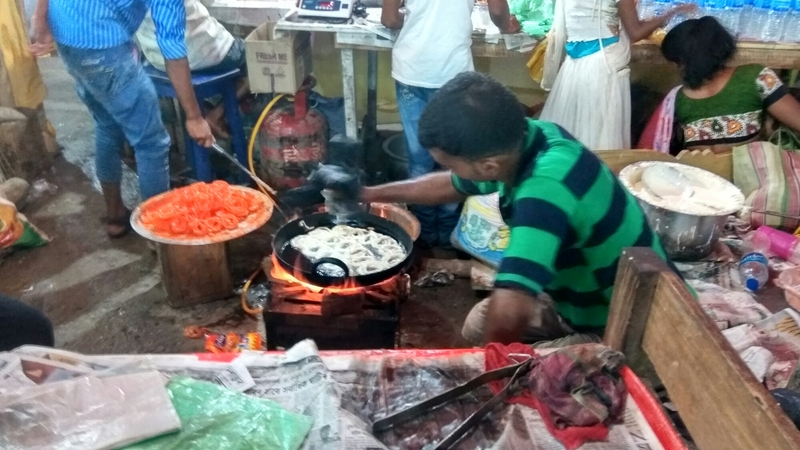 In one of the stalls in the corner, Dilip Kumar twirls jaleebis into a wok full of hot oil for sale. He is originally from Muzaffarpur, Bihar and sells chana on most other days. Dilip Kumar doing his thing. At the end of the row is a stall selling toys, manned by a few children. Overseeing the whole affair is Hakim Choudhury. 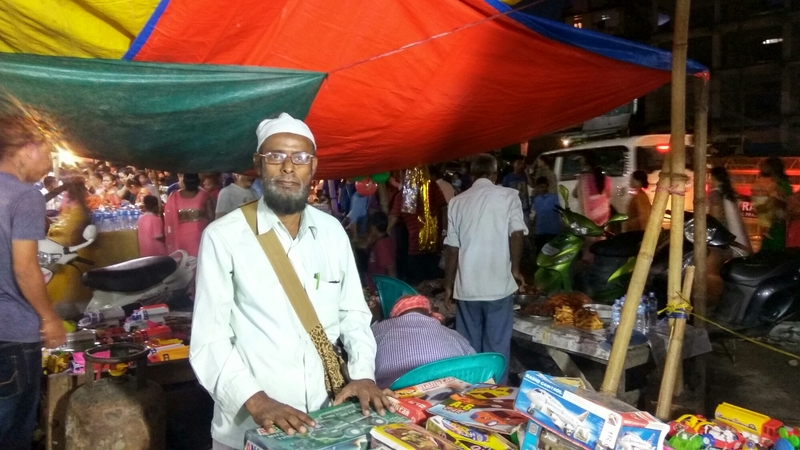 Sporting a silvery beard and wearing an Islamic skull cap, Choudhury tells me that business wasn’t great the previous night since it had rained. I learn that he’s from Karimganj, Assam and came to Itanagar 35 years back. “There were only seven shops here at that time,” he says, contrasting the present scenario. Choudhury says he hasn’t had time to go to the temple yet but will go once the crowd subsides since he has to attend to customers. Hakim Choudhury came to Arunachal 35 years ago. “Does your faith allow you to enter the pandal,” I ask. “Why not? What’s the difference between bhagwan and Allah after all,” he asks rhetorically.